In this chapter, we present an important new shift in mobile phone usage—from communication tool to “networked mobile personal measurement instrument.” We explore how these new “personal instruments” enable an entirely novel and empowering genre of mobile computing usage called citizen science. We investigate how such citizen science can be used collectively across neighborhoods and communities to enable individuals to become active participants and stakeholders as they publicly collect, share, and remix measurements of their city that matter most to them. We further demonstrate the impact of this new participatory urbanism by detailing its usage within the scope of environmental awareness. Inspired by a series of field studies, user driven environmental measurements, and interviews, we present the design of a working hardware system that integrates air quality sensing into an existing mobile phone and exposes the citizen authored measurements to the community—empowering people to become true change agents. Mobile phones are powerful tools indeed—collapsing space and time by enabling us to reach out to contact others at a distance, to coordinate mico-planning events, and to reschedule activities at a moment’s notice. But with all of their abilities they lack the superpower we perhaps need most—the ability to measure and understand the real world around us. We carry mobile phones with us nearly everywhere we go; yet they sense and tell us little of the world we live in. Look around you right now. How hot is it? Which direction am I facing? Which direction is the wind blowing and how fast? How healthy is the air I’m breathing? What is the pollen count right now? How long can I stay outside without getting sunburned? Is the noise level safe here? Were pesticides used on these fruits? Is this water safe to drink? Are my children’s toys free of lead and other toxins? Is my new indoor carpeting emitting volatile organic compounds (VOCs)? Now look to your phone for answers about the environment around you. What is it telling you? For all of its computational power and sophistication it provides us with very little insight into the actual conditions of the atmospheres we traverse with it. In fact the only real-time environmental data it measures onboard and reports to you is a signal to noise value for a narrow slice of the electromagnetic spectrum (Figure 1). Certainly one could imagine accessing the web or other online resource to find an answer to some of these questions. But much of that online data is calculated and published for general usage, not for you specifically. For example, the civic government may say that the temperature is currently 23ºC by taking one measurement at the center of the city or averaging several values from multiple sites across town. But what if you’re in the shade by the wind swept waterfront where it is actually 17ºC or waiting underground for the subway where it is a muggy 33ºC. The measurement that means the most to you is likely to be the one that captures the actual conditions you are currently experiencing, not citywide averages. Imagine you are deciding between walking to one of two subway stations and could gather live data from the passengers waiting on the platform at each stop about the temperature and humidity of each station at that very moment? What if you were one of the 300 million people who suffer from asthma (WHO, 2006b) and could breath easily as you navigated your city with real-time pollen counts collected by your fellow citizens? What if you could not just be told the level of noise pollution in your city but measure and publish your own actual decibel measurements taken in front of your home? What if you were one of the more than 3 billion people, nearly half the world’s population, that burned solid fuels, including biomass fuels (wood, dung, agricultural residues) and coal, for their energy, heating, and cooking needs indoors and yet had no way to monitor the health effects of the resulting pollutants on yourself and your family even though nearly 2 million people die annually from indoor air pollution (Ezzati & Kammen, 2002)? Citizen Science: Citizen science is a term used for projects or ongoing program of scientific work in which individual volunteers or networks of volunteers, many of whom may have no specific scientific training, perform or manage research-related tasks such as observation, measurement or computation. The use of citizen-science networks often allows scientists to accomplish research objectives more feasibly than would otherwise be possible. In addition, these projects aim to promote public engagement with the research, as well as with science in general. Some programs provide materials specifically for use by primary or secondary school students. As such, citizen science is one approach to informal science education. The longest-running citizen science project currently active is probably the Audubon Society’s Christmas Bird Count, which started in 1900. Air Quality Index (AQI): An index for reporting daily air quality. It reports a number, between 0 and 500 to reflect how clean (low AQI) or polluted (high AQI) the air is, and what associated health effects might be of concern to citizens. The AQI focuses on health effects people may experience within a few hours or days after breathing polluted air. AQI is measured for five major air pollutants: ground-level ozone, particle pollution (also known as particulate matter), carbon monoxide, sulfur dioxide, and nitrogen dioxide. For each of these pollutants. World Health Organization (WHO): The directing and coordinating authority for health within the United Nations system. It is responsible for providing leadership on global health matters, shaping the health research agenda, setting norms and standards, articulating evidence-based policy options, providing technical support to countries and monitoring and assessing health trends. They are the leading international body on air quality health research and standards. Participatory Urbanism: A research initiative directly focused on the potential for emerging ubiquitous urban and personal mobile technologies to enable citizen action by allowing open measuring, sharing, and remixing of elements of urban living marked by, requiring, or involving participation, especially affording the opportunity for individual citizen participation, sharing, and voice. Participatory urbanism promotes new styles and methods for individual citizens to become proactive in their involvement with their city, neighborhood, and urban self-reflexivity. One such example of Participatory Urbanism is the use of mobile phones to be transformed into environmental sensing platforms that support community action to effect positive societal change. Urban Computing: Urban Computing focuses on our lifestyles and technologies within the context of public urban spaces. Its research challenges differ from those found within the home where technologies readily intermingle across our intimate relations with friends and family members. It diverges from office and work environments where productivity and efficiency often dominate our computing tools. It is also not simply concerned with mobile or social computing. Urban Computing establishes an important new framework for deconstructing and analyzing technology and urban life across five research themes - people, place, infrastructure, architecture, and flow. 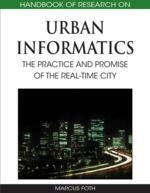 The diversity of these important themes promotes rich interdisciplinary research within the field of Urban Computing. Urban Computing leverages such forces as expanding urban populations, rapid adoption of small, powerful, networked, mobile devices, bluetooth radios, tiny ad hoc sensor networks, and the widespread influence of wireless technologies across our growing urban landscapes. Environmental Protection Agency (EPA): An agency of the federal government of the United States charged with protecting human health and with safeguarding the natural environment: air, water, and land. The are the primary reporting and regulation mechanism for air quality within the United States. Toxic Avengers: founded in 1988 by a group of high school students who organized themselves to raise community awareness about environmental pollution in their Brooklyn neighborhood. The name came from a comic book of the same name, whose characters were crusaders against toxic waste.” The students were from the El Puente Academy high school and the community organization’s program on community health, youth service, and leadership. What began as a science-class project turned into an organization that raised environmental awareness in the community and helped galvanize a community coalition that would be instrumental for taking action against neighborhood environmental hazards. The young people who formed the Toxic Avengers were part of a science class that was doing a unit on understanding the neighborhood environment. The class researched local hazards by gathering readily available information from local, state, and federal environmental agencies on the environmental performance of facilities in the community. The students also searched through newspaper archives to find references to environmental pollution in their neighborhood. They discovered, for example, that the Radiac Corporation—a storage and transfer facility for toxic, flammable, and low-level-radioactive waste located in the neighborhood—was the only facility of its kind in the entire city.